Don’t let the name fool you. The owners of the Happy Head must have had a sense of humor when choosing their name. As soon as a customer enters this massage establishment, they quickly realize that this is no ordinary massage spa. From the tranquil Buddha, to the fantastic décor, it’s amazing how they can offer such outstanding services at such affordable prices. High end hotel spas pale in comparison to the design and service that Happy Head Massage offers. And then there are the massage therapists. No matter how nice the massage establishment looks, the therapists are what make the massage matter. Happy Head Massage hires some of the most experienced therapists in their field. All the massage therapists are licensed, have at least 5 years experience, and are trained in both Eastern and Western massage. They also have a strict quality control program in place to ensure that every customer that comes in experiences a great massage every time. The Happy Head Massage concept was developed a few years ago to bridge the gap between the low end Asian massage parlors and the high end spas. The owners enjoyed the affordability of the Asian spas, but the quality of the massage therapy and the cleanliness of the facilities were always hit or miss. The high end spas usually offered better massage, but the price is too high to enjoy regular massages. That’s where the Happy Head bridged the gap. Happy Head Massage always offers a clean and professional environment. The massage is always top notch and always at affordable prices. A one hour Asian style body and foot massage only costs $29.They are open 7 days a week and have multiple locations throughout Southern California. Happy Head Foot Reflexology and Massage is expanding. The Happy Head is expanding beyond San Diego and is currently in the process of opening eight more locations in 2014. Happy Head Massage is the new way to get massage. There are no hassles and no gimmicks. There are no memberships and no contracts. Customers always get a great massage without the spa prices. Their signature massage service in San Diego is the Asian Fusion massage which incorporates the best of Eastern and Western massage into an unforgettable 90 minute session. This massage incorporates deep tissue massage therapy, Thai massage, foot reflexology, and full body massage. Reviews these days are an important part of any business. Happy Head Foot Reflexology and Massage in San Diego has outstanding reviews on Yelp, Google, and more. 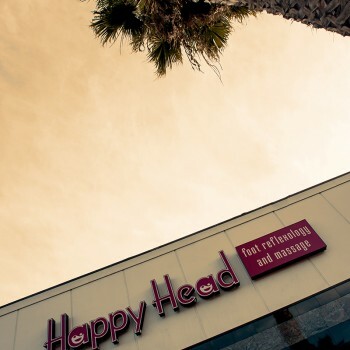 Melissa, a Yelp user, had this to say about the Happy Head: “I am blown away by this massage, especially for the price.” Kat, another Yelp user, says, “This place is the best kept secret!” Victoria, a Facebook user, says, “I will always visit this place when I visit San Diego! The best massage I ever had!” There are hundreds of reviews about the Happy Head throughout the internet. Especially with a name like Happy Head, people love talking about it. So what’s in a name? Happy Head Massage took a gamble when selecting their name. It obviously makes fun of the perception of Asian massage parlors. However, upon entering the Happy Head, customers quickly realize that there’s no funny stuff there. One thing is for sure; every customer leaves the Happy Head happy. To stir up an initial buzz, the Happy Head offered free Headgasms to new customers. A Headgasm is a take home scalp massaging tool that customers loved and found pretty funny. It’s ideas like this that initially got the Happy Head popular but it’s their never-ending quest to ensure top quality service to customers that makes them so successful. Happy Head Massage is the first, second, and last place that people think of when selecting a massage parlor in San Diego. With Happy Head Massage expanding, they are bringing more affordable high quality massage to more locations. For many, massage used to be just a luxury service. Now, the Happy Head has not only changed the perception of massage therapy; they are providing a service that almost anyone can receive on a regular basis.